I have just returned back from one of the most deeply profound and memorable trips I have ever taken. It truly was a journey of a lifetime, one that touches the core of your soul and takes you into the depths of your heart that even you can never reach yourself. They say ‘it takes a village to raise a child’, well, ‘I am’ that child and ‘Rihla’ was my village and I am so very grateful to all of the organizers, scholars, volunteers, fellow students and friends that I had encountered on this trip. You all are responsible for the beautiful life lessons that I have learned in these 3 wonderful weeks. I will never be the same again. The most difficult thing about this whole journey is to now keep it all alive in my heart just like the first time I immersed myself in this course. I am grateful as I know that I am not alone on this journey and that all of us who took this Rihla together will forever be bonded and will be there for each other in need. Konya, Turkey is truly one of the most beautiful and peaceful cities I have ever visited. One truly gets that same feel as if one is in Madinah (the city of our Beloved Prophet Muhammad peace and blessings be upon him.) 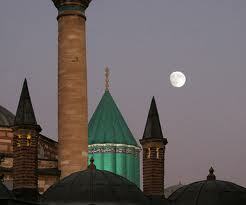 Konya exudes tremendous peace and you can feel and see the love of Mawlana Rumi throughout the entire town. Rumi epitomized love and the meaning of what it is to “be in love”. That love reached our souls in a way where we will never go back not knowing who this special person was. He was known for his love of Shams of Tabrez who was his spiritual Master who helped him to reach that high place (maqaam) of love for the One and only One (Allah). If there is one lesson that Rumi taught me, that is in order to love Allah Almightly (God) one must kill one’s ‘Nafs’(egoistic self) and allow Allah’s love to fill your heart.` If there is any ego left in us then Love can never pour in. We must spend the rest of our lives killing our egos and allowing Allah SWT to grant us His Blessed Love ameen. May we all be able to find our ‘Shams’ who can teach us how to love Muhammad (pbuh) and the love of Allah Almighty inshaAllah and may we all be like Rumi filling ourselves with His Love ameen. Peace and blessings be upon the lovers of Allah the best amongst the lovers is Rasool Allah salalahu alaihi wassalam. This entry was posted in Uncategorized and tagged #WhoIsMuhammad, Deen Intensive, Journey of a Lifetime, Konya, Mawlana Rumi, Rihla, Rumi, Turkey. Bookmark the permalink.